Due to popular demand we have put together some e-mail hosting packages geared towards customers that require less storage per mailbox than our standard offer of 25GB per mailbox. Plans are available on a yearly basis or per month, depending on required volume. 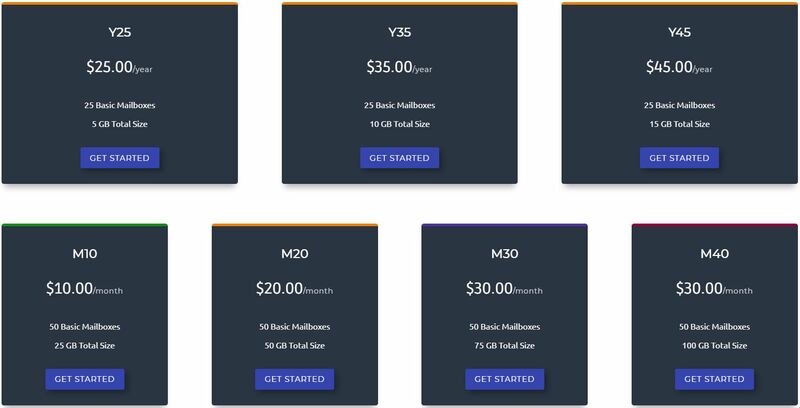 Each e-mail hosting package gives you the option to add up to 25 Basic mailboxes for the yearly plan and up to 50 Basic mailboxes for the monthly packages. Each mailbox will have all the features of our Basic E-mail, except the 25GB of storage. In addition, you can combine packages to better suit your needs. E-mail hosting packages are not compatible with our standard Basic E-mail and Enhanced E-mail services which means you can have active either a package-based plan or a custom plan. However, if you ever need to upgrade from a package in terms of storage or number of accounts you can do so by upgrading to a regular plan, at any time. Find more information about our e-mail hosting services on the pricing page or contact us for more details. Sign up now and get a 30 days free trial for any of our new E-mail Hosting Packages.